When the Las Vegas Strip’s Fountains of Bellagio added new music to its repertoire for the first time in six years, Crest Audio power amplifiers and MediaMatrix digital networked audio processors were there to help bring the magic to the throngs who flock to this man-made oasis. 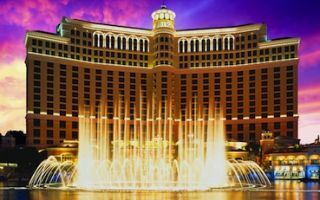 The Bellagio recently added iconic pop songs “Lucy in the Sky With Diamonds,” “Billie Jean,” and Glenn Miller’s “In The Mood”—with a multitude of Crest Audio CKi Series power amplifiers—to the playlist at the most celebrated, beloved free attraction on the Las Vegas Strip. The 8½-acre body of water that welcomes visitors to the Bellagio features more than 1,200 water cannons, including 16 “extreme shooters” capable of sending water streams up to 500 feet in the air, as well as a mood-setting fog system and nearly 5,000 lights to illuminate the display seven nights a week. Each fountain is programmed and maintained by a team of 30 specialists, and in its 14 years of operation, the Fountains of Bellagio have never missed a show due to a technical issue. A team of Crest Audio networkable power amplifiers provide high-quality sound reinforcement for the Fountains of Bellagio. The system includes 79 Crest Audio CKi 800V amps, 21 CKi 1600V amps, two CKi 800S amps, and one CKi 1600S amp, all of which are outfitted with Nx Ethernet cards for networking with the Peavey MediaMatrix NION n6 processor, which controls the zones, volume, EQ, mapping and more for the entire audio system. With the ability to deliver audio via CobraNet and control on one CAT-5 cable, the CKi series gives contractors and system designers an ultra-scalable system capable of economically powering anything from the smallest building to the largest theme park or stadium. CKi amplifiers are available in low impedance, 70-volt and 100-volt transformer isolated models and are backed by Crest Audio’s five-year warranty.